It’s in our nature to forget things. Our appointments are no exception. When a client forgets about their appointment, you lose money and you lose an opportunity to build on your client relationships. Something as simple as an appointment reminder the day before an appointment, sent to the client via SMS and email can help to significantly reduce no-shows. Until now, client reminders have been sent out manually through an SMS gateway or WhatsApp. This is time-consuming and often gets overlooked as your day gets busier. Wouldn’t it be incredible if your clients could be reminded automatically of their appointments while you sit back and relax? 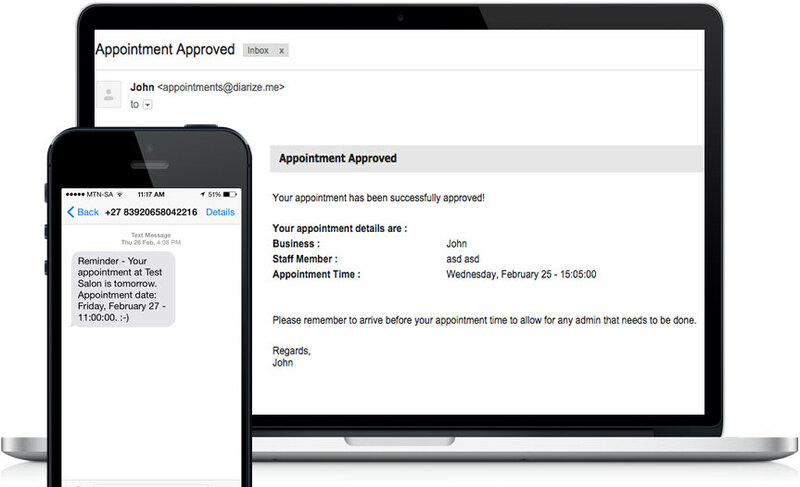 SalonBridge lets you configure your client notifications, giving you full control of how your clients get reminded of their appointments. Decide what you want your message to say, choose a time to send your reminders, and SalonBridge does the rest! All client messages are visible via your SalonBridge inbox, letting you keep track of what your clients receive. Notifications can even be switched off for individual clients. SalonBridge lets you set up notifications for appointment bookings, date and time changes, cancellations, and reminders that can be sent out the day before the appointment. In addition to this, we also allow you to send out ‘Thank You’ messages after their appointment is complete. The best part…SalonBridge gives you FREE SMSs every month as part of your subscription! Purchasing additional SMS credits is a quick and inexpensive process. Get SalonBridge – Start your free trial!